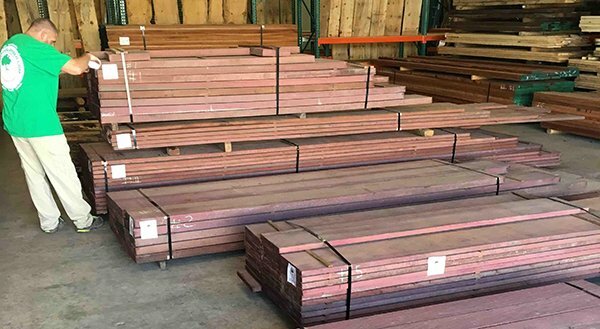 We have received some great looking Rough 4/4 (1” thick) African Mahogany in our NC and NY facilities. This mahogany is denser than its South American counterparts and is more stable when crafted into furniture or in other projects. Our batches of African Mahogany have some vivid grain pattern with deep browns and medium maroon streaks. Our stock is all kiln dried and ready for shipping. Additionally, in FL we also got some South American Purpleheart whose grain pattern is very pronounced and features a rich purple. If you’ve been thinking of creating a new piece of furniture or crafting that special project, this is your opportunity to add a unique look to it! This entry was posted in Exotic Hardwood, News, Wood and tagged african mahogany, genuine mahogany, purpleheart, stock african mahogany on April 29, 2016 by Mr. Ipe Hardwood.